Prissy Princess is the latest Play n Go powered video slot machine. The game has gone live at many Play n Go powered casinos, and it can be played right here for free. The game has a 5 reeled setup that houses 20 bet lines. This game takes players on a medieval adventure as they join multiple knights who are fighting for the heart of the Prissy Princess. So players better be ready for an action packed ride that has a medieval theme, which comes packing a lot of winning chances and bonuses. Players can see what the slot has to offer right here, prior to placing real money bets on the game at online casinos. Prissy Princess takes players on a medieval adventure, to the age of knights in shiny armors, sword fights and princesses. This is why players will see that the reels of the game are located on the walls of a fortress. Players will get to join these knights on their adventure as they claim their own share of medieval fortunes and treasures. They will be able to do that through the 20 lines as the generous line prizes they can give, as well as through the bonus features and bonuses that the game has to offer. Players can find more about the winning chances of the game and its features at the paytable of the game. The visuals of the game create the theme of the game perfectly. Therefore players will see the different medieval knights that the players will join in this adventure. Other icons include medieval weapons, shields, helms and armors, the princess, family emblems and more. All icons come in state of the art visuals that would provide players with an immersive ride. 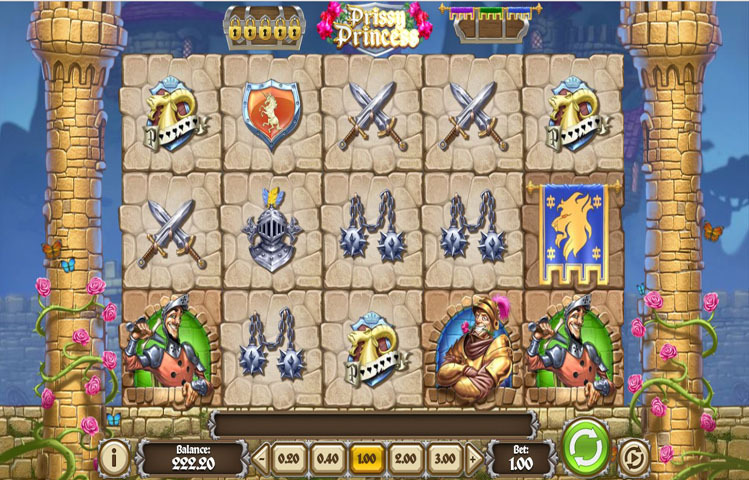 Prissy Princess knows how to reward players, whether through the 20 lines, or the multitude of special features that the game has. The first of the special icons is the Prissy Princess. This symbol is wild, and can replace all other icons appearing anywhere on the reels. On the other hand, it will not be able to replace the scatter icon, and it will not be able to contribute towards the Dragon’s Pride feature. Apart from the wild icon, there is the Crumbling Tower feature. This feature becomes active whenever players manage to get a combo of matching icons. The matching icons will disappear and the reel will crumble and new icons will fall in order to give players more winning chances, along with a re spin. Other features include the Treasure chest, the Dragons Pride and the Dragon’s Breath. There is also the Tournament feature that can be quite rewarding.